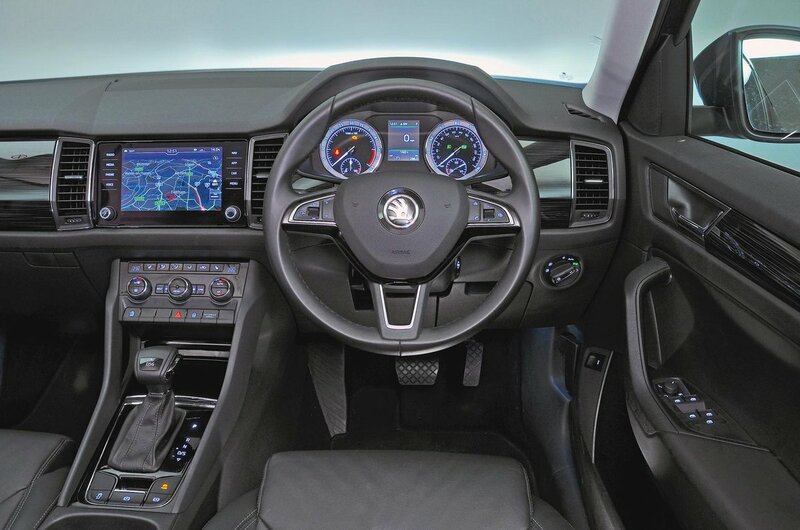 Skoda Kodiaq Interior, Sat Nav, Dashboard | What Car? 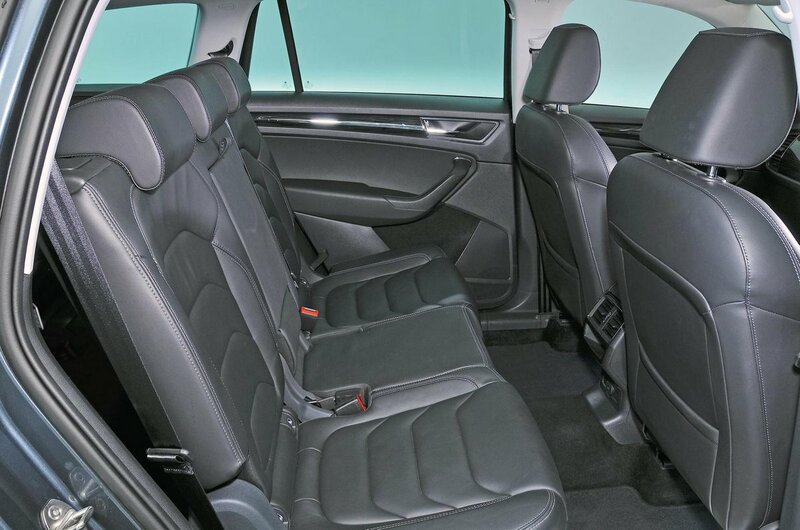 You sit nice and high in the Kodiaq, looking down on folk in their conventional hatchbacks and even smaller SUVs, such as the Audi Q2 and Seat Ateca. Pull up alongside a Range Rover, though, and you suddenly feel quite small. The driving position is hard to fault, with plenty of adjustment in the seat and steering wheel to set everything up just how you like it. The only slight issue is that adjustable lumbar support doesn’t feature as standard on entry-level S and SE models. The Kodiaq’s dashboard is logically laid out and a doddle to use. There are plenty of big, clearly labelled buttons, such as those for the climate control, that you can hit easily on the move, while the instruments are crystal-clear and legible at a glance. Because the Kodiaq is fairly boxy, it’s generally easy to see out of. Your view of the road ahead, and sideways when pulling out of junctions, is largely unobstructed, and even over-the-shoulder visibility isn’t too bad. The third row of seats (if fitted) do get in the way a bit when erected, though. Rear parking sensors come as standard on SE trim and above, while front parking sensors and an area view monitor (which displays a bird’s-eye view of the car on the touchscreen) are available as options. If you’re still nervous about parking, a self-parking system is also available. From SE L trim, you get excellent adaptive LED headlights that do a superb job of lighting your way at night. Choose any trim apart from entry-level S and you’ll get an 8.0in touchscreen as standard. This is easy to operate, thanks to clear, logical menus, and there’s barely any delay between you pressing the screen and whatever you’ve asked for happening. Gadgets such as a DAB radio, a USB socket and smartphone mirroring (Apple CarPlay and Android Auto) also come as standard, while SE L trim adds built-in sat-nav functionality. The range-topping Edition model even has wireless phone-charging, while an optional Technology Pack (available on SE L trim and above) can turn your Kodiaq into a wi-fi hotspot. 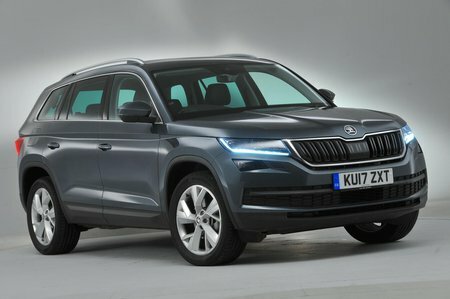 At the entry level of the Kodiaq line-up, S trim gets a simpler 6.5in touchscreen with a DAB radio and a USB socket. The Kodiaq’s interior is a smorgasbord of soft-touch materials and nicely damped buttons and switches; any harder plastics are kept well out of site. It makes rivals like the Nissan X-Trail and Hyundai Santa Fe feel decidedly low-rent inside, and even edges the Kia Sorento for outright quality. All models get a steering wheel wrapped in fine quality leather, making it a pleasure to hold. There are lots of fancy dashboard inserts available to jazz up the interior if you think the standard look is a little bland, while the interior light pack makes the Kodiaq feel that bit more special inside.